How Fast is USB Disk on an AirPort Wireless Base Station? So, I purchased a couple of new 1TB USB hard drives this week and have been trying to figure out how to best set them up for optimal speed and accessibility. 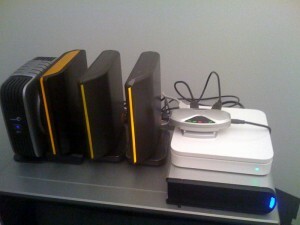 The latest setup is to connect them via USB to my Apple AirPort Extreme Basestation as AirDisks. I’ll be backing up my laptops to these drives daily (I’ll share the backup details later), so I was curious just how fast I could dump data to them. How fast should I be able to copy data to the USB hard drive attached to my Airport Extreme? But are those numbers realistic for average write speeds? I’m currently averaging about 10.5 GB/hr. 3.5 MBps = 12.3 GB/hr which is about what I’m experiencing so far. I have 4 USB disks connected to by AirPort, but I think this throughput should be for all drives combined. If you have a USB disk attached to a network with something like the AirPort Extreme, let me know what kind of read and write speeds you are averaging. Ok Bill when I read this it hurt my brain a little : ) I was just wondering how you keep up with all the new teck that comes out seemingly all the time? For those techies who may actually care about this… I appear to be overheating my AirPort Extreme after constantly transferring data for about 6 hours. So, I’m thinking the next iteration of this will involve purchasing a new USB card for my office computer and connect the drives directly to that computer. That should be much faster all around.